All cultural practices applied to grapevines are aimed at achieving the goals of acceptable yield and acceptable fruit quality. 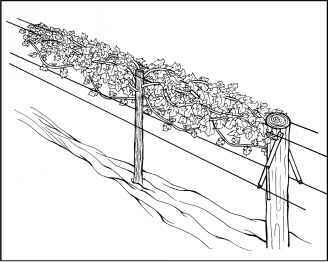 The intensity of a grower's vine management will reflect what he considers "acceptable" yield and fruit quality. Modest crops of imperfect fruit may be quite acceptable to a backyard grower, but such standards would put a commercial grower out of business. Several good vine management options for table grape production are presented below. Growers need to choose among these options to satisfy their desired intensity of vine management. Grapevines are properly managed with a specific growth form. 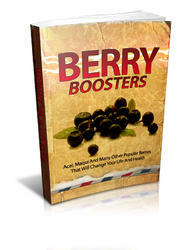 The steps taken to establish this form constitute a training system. From the numerous training systems that have been devised for grapevines, the following are recommended for table grape production in a temperate climate because they promote both fruit maturity and development of highly fruitful nodes on fruiting canes. Modified Munson Training — This is the best training system for producing table grapes in a temperate climate. It places clusters and the leaves close to them, which ripen the fruit, in a very uniform pattern well exposed to sunlight (Fig. 11). Moreover, this training system facilitates harvest by separating clusters from the entanglement of shoots and puts them at a comfortable height for picking. Fig. 11 - Clusters of 'Himrod' seedless table grapes on a vine utilizing a modified Munson training system. Fig. 12 - A vine with modified Munson training before shoot positioning. 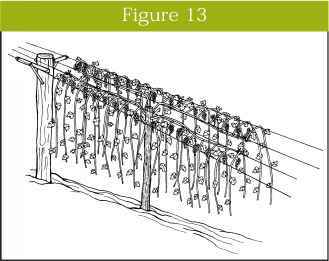 orients shoots from the central plane of the trellis to wires that are supported by cross arms (Fig. 13) and then down vertically. The wires on the ends of the cross arms are called "catch wires" because they catch or support shoots in their desired location. The result is a grapevine canopy with most of the leaves directed away from the clusters to avoid fruit shading. The single layer of leaves that is allowed to develop at the top of the trellis creates a microclimate of filtered sunlight for the clusters. A grower must be willing to construct a specialized trellis with cross arms (Fig. 14) to benefit from the modified-Munson training system. Many years of experience with these cross arms suggest that making them collapsible, like an umbrella, makes the task of shoot positioning much easier. At the time of winter pruning, these collapsible cross arms are lowered (Fig. 12) so the trellis appears to be a normal two-dimensional trellis. This facilitates pruning the vines and tying canes to wires at the top of the trellis posts. After the first pass of shoot positioning, the cross arms can then be raised to their outstretched position (Fig. 13). A second touch-up pass of shoot positioning a couple of weeks later will complete the orientation of shoots. Fig. 14 - The materials and dimensions for constructing collapsible cross arms for the modified Munson training system. Fig. 13 - A vine with modified Munson training. Shoots have been positioned and the collapsible cross arms raised into their support positions. Where are table grapes grown? How table grape vines are trained in india? 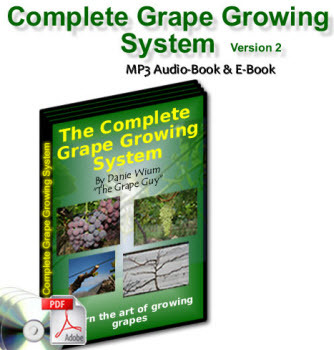 What is the modified minson grape vine training system? 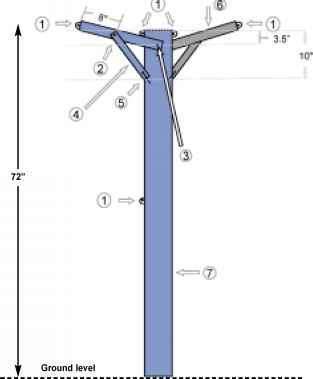 How to build a modified munson trellis? How to build munson grape trellis? How to care for grape vines?